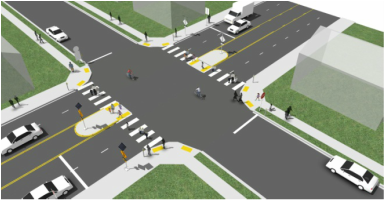 The following section describes crossing treatments that can be applied at intersections. A legal crosswalk may be unmarked, striped with standard transverse white lines, painted yellow to indicate a school zone, or otherwise striped to increase visibility. Each treatment serves a different role in the pedestrian network. These pages also describe treatments used to enhance a crosswalk to give pedestrians a better sense of safety, such as pedestrian refuge islands. The simplest form of marked crosswalk is two transverse lines, indicating the crossing area. A marked crosswalk signals to motorists that they must stop for pedestrians and encourages pedestrians to cross at designated locations. 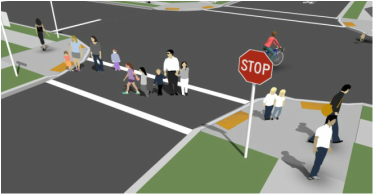 Installing crosswalks alone will not necessarily make crossings safer especially on multi-lane roadways. For locations with higher pedestrian volumes or traffic speeds, crosswalk styles other than transverse crosswalks can be more visible to motorists. 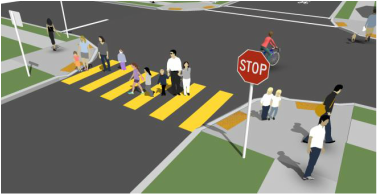 These high-visibility crosswalk styles include Continental, Ladder, or Zebra striping. 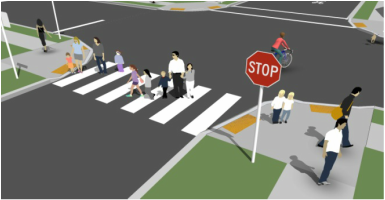 Where a crosswalk is painted yellow, it indicates to drivers that they are within 500 feet of a school boundary or on a designated route to school and should be especially attentive to the possibility of smaller people crossing the street. Curb ramps allow all users, including people in wheelchairs and using mobility aids, to make the transition from the street to the sidewalk. 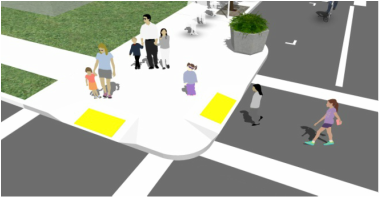 Truncated domes on curb ramps help people with sight impairments find the safest place to cross the street. Median refuge islands are protected spaces placed in the center of the street to facilitate bicycle and pedestrian crossings. 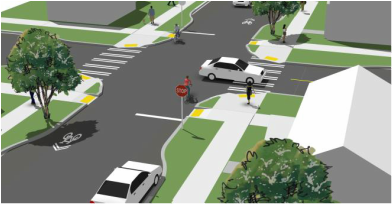 Crossings of two-way streets are simplified by allowing bicyclists and pedestrians to navigate only one direction of traffic at a time. This treatment is most useful on high-volume multi-lane roadways that otherwise would be difficult to cross. Recommended minimum width for pedestrian refuge islands is 6 feet. Crossbikes are a type of pavement marking designed to direct bicyclists through an intersection area or midblock crossing, similar to a crosswalk for pedestrians. Most commonly, crossbikes are made up of simple dotted lines or “Elephant’s Feet” extending from bike lane lines. More sophisticated treatments include bicycle markings or green colored pavement within the crossing area. Curb extensions shorten pedestrian crossing distance, increase visibility, and encourage turning vehicles to slow down. They can be used at any marked crossing where the parking lane can absorb the extension of the curb. Curb extensions may be built with drainage channels that do not impact existing stormwater flow, or with integrated bioswales that filter stormwater and facilitate infiltration. Curb extensions should not encroach on bike lanes.